To satisfy the expectations of its guests, the Imerti Boutique Resort Hotel in Skala Kallonis Lesvos, completed a major renovation and expansion of the premises at the beginning of 2014. The owner family Kefaladellis responses to ecologically conscious guests wanting to contribute positively to environmental protection and quality of offered services, decided to implement a set of specially designed interventions both to save energy and natural resources, as well to increase visitor satisfaction in Lesvos. Today, the Imerti Boutique Resort Hotel is a tourist company certified ISO 9001 (Quality Management System) and ISO 14001 (Environmental Management System). These new certifications, following the certification of Green Key (Green Key) and discrimination Greens Leaders from Trip Advisor, reinforces the continued efforts of the business for both quality of service and for nature conservation at local and global levels using environmentally friendly products and technologies. 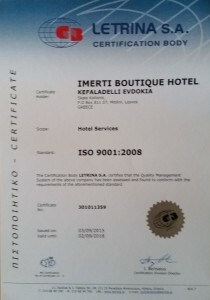 For the implementation of the standard ISO 14001, certified by the International Organization for Standardization ISO, the Imerti Boutique Resort Hotel proceeded to several changes, such as the installation of new air conditioning units energy class, install more solar panels connected to larger hot water storage tanks, installation of new televisions and refrigerators energy class in all rooms, replacement of all light bulbs in indoor and outdoor LED as a new type on or economy of most bulbs and replacement batteries and other systems to reduce water consumption as well as many others. 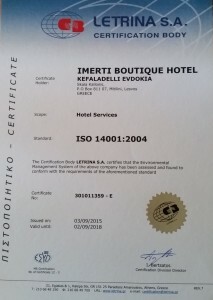 The environmental and quality policy of the Imerti Boutique Resort Hotel will continue with the adoption of various programs which are sustainable in the hotel and catering areas. It is our firm commitment to make our hotel the ideal place for residents and workers and provide an example for local and international companies. 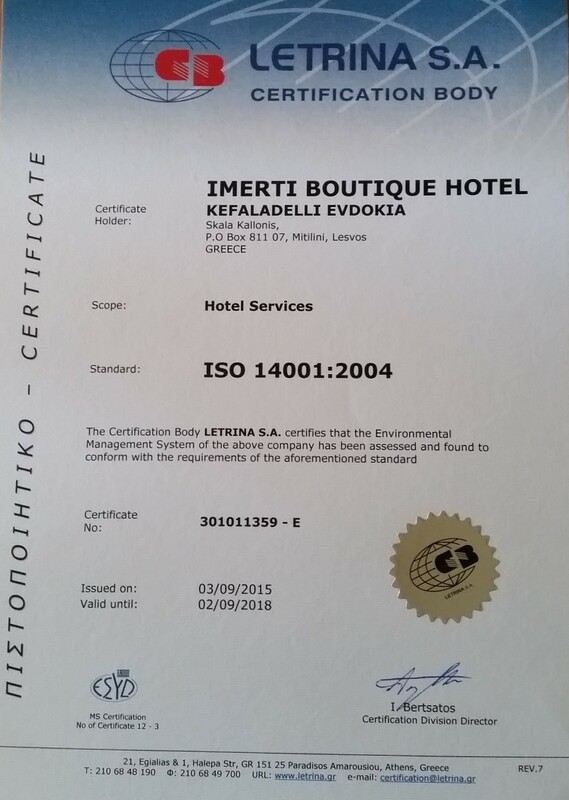 With ‘green’ facilities the Imerti Boutique Resort Hotel has achieved to reduce energy consumption by 26%. The new environmentally friendly systems, ensure that the Imerti significantly reduces emissions of carbon dioxide (CO2) and saving larger amounts of water, while providing better environment for guests and employees. The Imerti Boutique Resort Hotel implement new ‘green’ measures and focus areas, targeting as much as possible, local, organic certified (by the producer on the table) products. Moreover focused on reducing waste, the recycling and composting of the waste.